Cross passages, the short tunnel segments connecting two main tunnels, can be difficult to construct under certain soil conditions. The temporary earth support and ground water control provided by the tunnel boring machines cannot be used for the cross passages, often only 10 to 20 m long. Ground freezing has been used successfully for cross passage construction in Europe and Hong Kong, and is now being used for the first time in the United States on the Port of Miami Tunnel. Ground freezing, the process of converting pore water to ice is accomplished by drilling a series of pipes, typically spaced approximately 1 m around the perimeter of the proposed excavation. Some subsurface soil and groundwater conditions require two rows of freeze pipes. A refrigerated coolant, ethylene glycol or calcium chloride brine, is circulated through the pipes, forming a waterproof, rock-like mass. There are basically two approaches to freezing tunnel cross passages, and typically the size of the cross passages dictates the method. The most common approach is based on the drilling of the freeze pipes horizontally from within one of the tunnels as shown in Figure 1. The drilling procedure for the horizontal pipes is somewhat complex and requires extensive drilling expertise. Prior to drilling, it is necessary to install a blow-out prevention device to withstand the hydrostatic pressure from the tunnel exterior. Alignment of the freeze pipes is essential to prevent deviation of the pipes during drilling. Once the pipes are drilled and installed a gyroscopic survey is conducted to ensure that adjacent freeze pipes have not deviated, which potentially could create a gap in the frozen earth mass. There are two approaches to refrigeration plant location. In some cases it is technically appropriate and economically feasible to place small refrigeration plants inside the tunnel, located at each individual cross passage. Some projects, however, require higher capacity ammonia refrigeration plants that must be installed and operated from outside the tunnel with the circulating coolant pumped in some cases several thousand feet. 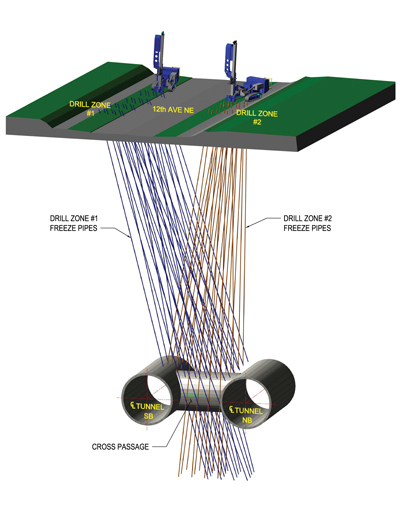 The second approach to drilling freeze pipes for cross passages involves drilling and installing the freeze pipes from the ground surface as illustrated in Figure 2. 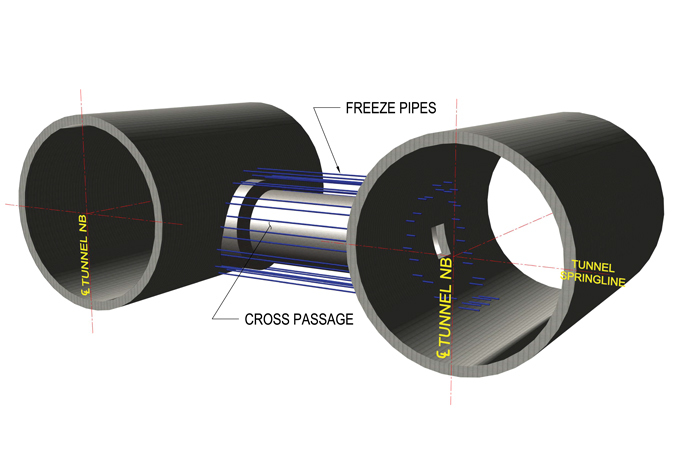 The geometry of the freeze pipes in the surface approach is required when the diameter of the cross passages are too large to accommodate drilling from inside the tunnel. As with the drilling from inside, gyroscopic surveys are required to verify alignment between adjacent pipes. In both of the approaches, the engineering design and analysis of the frozen soil support system is similar. The design begins with an accurate and comprehensive geotechnical investigation. In addition to the investigation methods required on all tunnel projects, those involving freezing require additional information. This information includes sampling and testing for soil thermal properties and frozen earth strength properties. Frozen earth exhibits time dependent, rheological behavior. To accommodate this behavior in design, short- and long-term compression creep tests are conducted. Since frozen earth strength is also temperature dependent, it is necessary to conduct the compression creep tests at various temperatures. The data gained from the investigation is used in both a structural and thermal analysis. The structural analysis will evaluate the required thickness of the frozen earth “doughnut” while the thermal analysis will evaluate the required time to form the frozen mass as well as the required refrigeration capacity. Once the freeze pipes have been drilled and installed, and the refrigerated brine circulation is initiated, it typically takes between 6 and 10 weeks to form the frozen mass. This variation is a result of pipe spacing, initial ground temperature, coolant temperature and the required frozen wall thickness. Determination of the required frozen mass is evaluated with a series of specialized instrumentation. A series of temperature monitor pipes (two to four per cross passage) are installed slightly to the exterior of the freeze pipes. Within each pipe are series of thermistors, RTDs, or fiber optic temperature measurement devices. In the interior of the frozen mass, pressure transducers are installed to measure interior pore water pressure. As the frozen ring is formed, and the ice encroaches near the center of the excavation, the pressure will build and can be readily measured. This increase in pressure is a key indicator that the frozen ring is formed. In some cases it is necessary to provide relief of this pressure into the tunnel. When the instrumentation indicates that the frozen earth mass has reached the required dimensions, excavation may commence. Excavation must be completed through a safety hatch allowing immediate closure in the event there are problems with the excavation. As the excavation a progress, the exposed frozen earth is supported with shotcrete until the permanent lining is installed. In most cases the freezing remains operational until the final lining is completed. While ground freezing is undoubtedly the most positive and safest method of temporary support and groundwater control, there are risks associated with it. Groundwater moving greater than 1 m per day can retard or even prevent the formation of the frozen earth mass. If moving groundwater is a potential issue, it may be necessary to pre-condition the soil with grouting or deep soil mixing. While these techniques cannot provide 100 percent water cutoff, they can reduce the permeability enough to reduce flow velocities. Another risk associated with freezing for cross passages is disruption of power or refrigeration. When using ground freezing for this application it is imperative that backup power and refrigeration sources are available on site. As with any subsurface construction technique, success can only be ensured by a qualified and experienced ground freezing subcontractor as well as coordination and cooperation with the tunneling contractor. Joseph A. Sopko, Ph.D., P.E., is Manager, Ground Freezing Services, Paul Schmall, P.E., is Vice President and Chief Engineer, and Robert Chamberland is project engineer at Moretrench, a nationally recognized specialty geotechnical contractor.